Are you ready for some football?! With three men in my house, I have to be! It's Traci, and I'm back to share another mini with you. 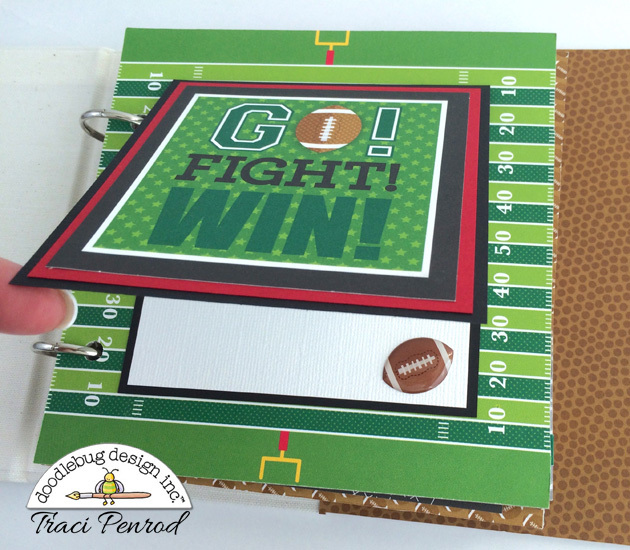 This week, the design team is playing with "Touchdown" ... an awesome addition to Doodlebug's new sports collections. I decided to keep this album fairly simple. Perfect for photos from pee wee ball to high school. Great for coaches, super bowl parties, or tail gating....this collection will help you save all your football memories! 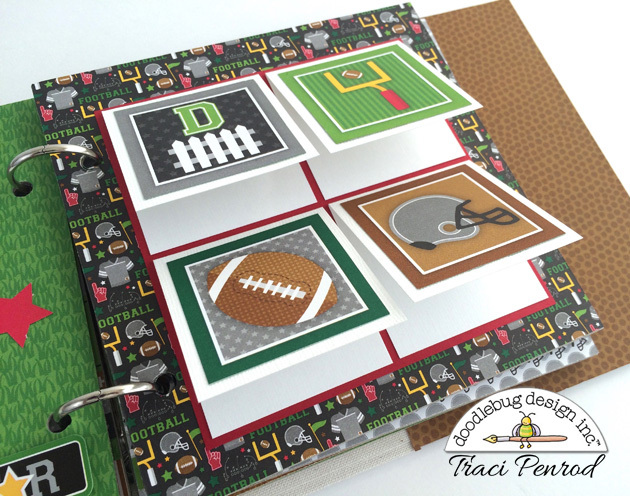 I combined Doodlebug's Touchdown collection with a chipboard album from Bo Bunny. I layered papers from the 6x6 paper pad on the cover, along with some stars from the die-cut pack and lots of wonderful stickers. 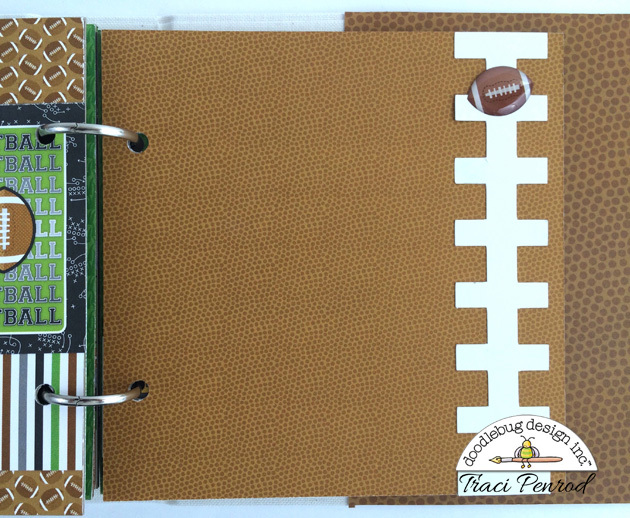 I also added an epoxy football sprinkle over the football on the paper just to give the cover a little pop of fun and dimension. For this last page, I kept it simple with a football laces border cut from my Silhouette machine. Aren't the paper patterns perfect!? I love the football texture pattern, the 6x6 football field with the numbered yard lines, and the helmets. 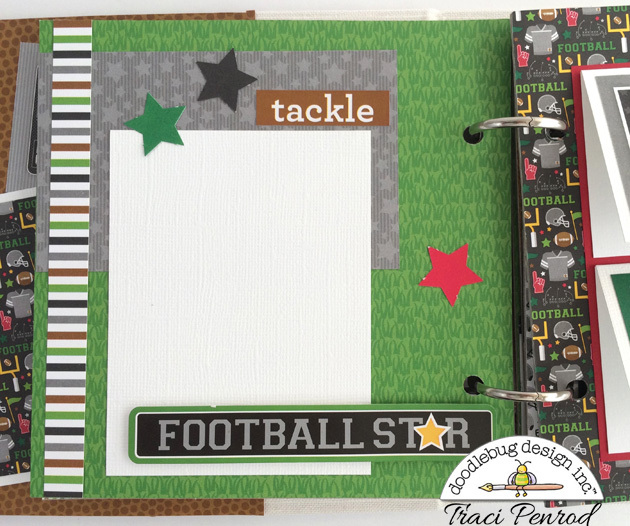 You'll have tons of fun with this collection if you're a football fan! Happy crafting! I absolutely love this! We are a huge football family and I definitely need to get my hands on this collection! This is the cutest album, love your mini's!!!!!! Love!!! Your albums are always so fun!